G.C.A.R.T. 'S purpose and concern is for the welfare of all domestic animals in emergency situations. G.C.A.R.T. 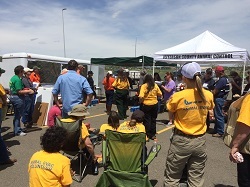 assists firefighters in the evacuation of large stock animals and smaller companion animals in the event of wild fire, toxic spill, or other natural or manmade disasters that may occur in Gilpin County. Please download and complete the WINDOW form below and place it in a easily seen location for those first responders. They will then notify GCART to come get your animals if you are not there and let us know how many animals we are picking up. Change the form as your animal population changes. Please click on any of the links below for more information about that link. Please call Vicki at 303-582-5214 with questions. Does your livestock know how to be loaded into a trailer? Does your cat or dog go into a kennel? Have they ever done it or do you practice it regularly? 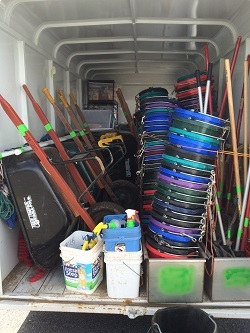 If not, then they won't be able to be loaded by GCART volunteers if they need to be evacuated because they will refuse to be loaded or kenneled and there won't be time to teach them at that point. The best that could be done if they won't load would be to open the gates or doors and let them fend for themselves during the disaster. How do you change this option? By calling GCART and scheduling a loading clinic for your livestock or if there is enough demand we will schedule a kenneling clinic for those smaller pets. If you don't have a trailer to practice with, we can bring one out to do the clinic and let them at least experience being loaded into a trailer. THIS IS VITAL if you want them loaded and removed during a disaster. If you have your own trailer, then PRACTICE with them. This is also important for your dogs and cats. Do they have a kennel? Are they used to being in it? If not PRACTICE, PRACTICE, PRACTICE until they are comfortable being in their kennels. If you don't have a crate or kennel, call GCART and we will give you one that you can transport them in. Thanks to generous donations, we have several plastic crates we can hand out to dog and cat owners so you can move them when needed. If you need help with either your livestock or pets, please call GCART and arrange a loading clinic for them. American Humane is sponsoring a Disaster Sheltering for Companion Animals on November 3 and 4, 2018. If you want to be a certified volunteer for GCART, this is one of the classes required. To sign up, please click the link for the flyer and more information. Other trainings being considered will include arranging outings at the various ranches and farms in the County to learn how to specifically handle their stock such as alpacas, llamas and yaks. Those outings will also be posted here as soon as they are arranged. If you have ideas or a ranch you would like to be included in these outings, please give Vicki Nemec a call at 303-582-5214. The Wildland Fire Awareness class was held the end of September. This class was a wonderful class for learning about fire and how it acts. It was a two-day class given by the Code Three Association and there were six GCART members attending including two animal response teams members from California. All in all, it was a valuable class for those going out into the field during a fire emergency. It is hoped there will be another one scheduled later in 2019 so let us know if you are interested in taking it. On July 8, 2017, members of GCART visited the Head in the Sand Ranch on an invitation from the owner, Greg Boyle. This is the only Ostrich/Emu ranch in Gilpin County. Greg offered to show GCART members how to safely handle these large birds in case they should ever need to be evacuated to the fairgrounds or other shelter during an emergency. The ranch currently has 6 young Emus, about 12 Ostriches, several chickens, a couple of turkeys, one cow, two horses and several cats of varying ages. Some of the things we learned included items like we would need to throw dirt on the floor of the trailer so they would have good footing, cover all windows in the trailer so they can't see out and if that is not possible, last resort would be to cover their heads with a bag so they can't see. We also learned how to heard the flock so they would go into the trailer and that since they are a flock bird, they would most likely all stay together if at all possible. We learned what they look like when they are upset and when they are just hot. We also learned that females are better handlers for these birds especially if the males are in heat as they are extremely sensitive to testosterone and men could be in danger from them. You can tell when a male ostrich is going into heat by the red coloring along the front of the legs and face, the darker it is the further into heat the ostrich is. An ostrich can handle colder temperatures but prosper best in climates between 86 degrees F and -22 degrees F. Emus can tolerate temperatures down to -65 degrees and that they are partial to green objects; ostriches are partial to red. All in all it was a wonderful, interesting day learning about an animal not many of us have been near before. They can be very dangerous - one kick from their powerful legs can break leg bones or ribs - but for the most part, these birds handled well and were not vicious, Greg has made sure they are socialized animals. However, several of us left with "love bites" including Pat, who received two of them from one of the adult females that just seemed to take a liking to her. That is how they sense their surroundings, by pecking at things to find out what they are. Greg has indicated that he would agree to another class in the fall with other GCART members. Keep an eye here for that class schedule when it has been set. GCART wants to thank Greg for allowing this training and for agreeing to a second class so all GCART members interested can also learn about these amazing birds. ESF-11 class was held March 25, 2017 at the Gilpin County Justice Center. The class had 11 participants from as far away as Pueblo and Pitkin County plus two from Gilpin County. A HUGE "Thank you" to Debrah Schnackenberg for teaching the class and her patience with all the questions thrown at her. Also a HUGE "Thank You" to Nancy Mulholland for her assistance in organizing the class and putting things right again after the class. 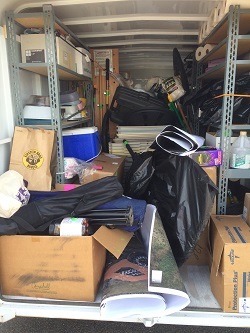 A lot of material was covered fairly quickly, but a lot was taken away from the class that will only benefit GCART during the next emergcency. ALSO on March 25, 2017, another HUGE "Thank You' goes out to Larry Sterling and those who helped him round up sheet in a local neighborhood. Once found, the sheep were gathered up and sent back safely to the owner with the GCART volunteers more exhausted than the sheep! The successful shelter set up in July proved GCART can do it! The Exhibit Building/Fairgrounds housed close to 150 animals during the Cold Springs Fire in Boulde the first part of July. The shelter was open for 10 days and housed just about everything including llamas, goats, cows, horses, ducks, geese and chickens as well as a few dogs and cats. 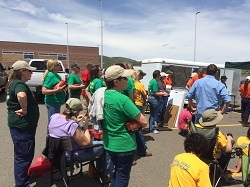 Much was learned during the shelter and it was felt that the next time, GCART will be even better prepared to handle the emergency. STATE TRAINING EXERCISE was a huge success. 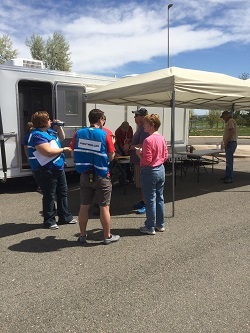 Five GCART members went to the exercise Saturday, May 21, 2016 staged at Chatfield High School beginning at 7:00 a.m. Involved were members of Jeffco Heat, the Animal Evacuation Team, Animal Control, Colorado State Patrol, Jefferson County Sheriff, Salvation Army, American Red Cross, Foothills Animal Shelter and several other outside organizations observing and learning. More will be discussed about this exercise at the next GCART meeting on June 7, 2016. If you are interested in hearing how it went, please plan on attending. The new GCART organization is working out well. Members only need to attend a meeting if they want to discuss what is on the agenda or become more knowledgable about GCART's inner workings. If you want to be included in the email group, please send a request to Vicki Nemec at gcart@co.gilpin.co.us.